Certain Southeast Asian countries, such as Burma (modern Myanmar) and the Philippines were among the earliest places where the Columbans established missions outside of China. In the 1950s and 60s, this region, along with most of the rest of the world, had become engulfed in the “Cold War” between communist and the free nations. By 1960, this global clash was sowing the seeds of the Vietnam War, and it would directly affect the Columban Fathers. The January 1960 issue of The Far East magazine featured an article about the expulsion in summer 1959 of two Columbans, Archbishop John Dooley and Father Terence O’Driscoll from Hanoi, North Vietnam. 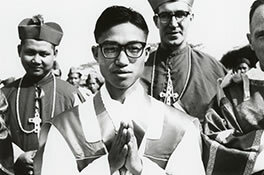 Since 1951, Archbishop Dooley had served in Hanoi as a special Vatican Apostolic Delegate to Indochina, with Father O’Driscoll as his secretary. In 1954, communists under the leadership of Ho Chi Minh took over North Vietnam. The North Vietnamese regime began to persecute and intimidate religious institutions there, and in 1959 kicked out the two Columbans from the country. Many of the other 1960 issues of The Far East describe the Columban successes in Burma, including clinics that the Columban Sisters ran, Kachin language publications that the Columbans started, and others. But trouble was brewing there as well. In just two years, General Ne Win’s military junta would seize control of Burma and begin the process of throwing out the Columbans from that country. One inconspicuous caption in the January 1960 issue of The Far East discusses and shows a photographic image of an ethnic Kachin seminarian, Paul Zinghtung Grawng, speaking with Columban Father Lawrence McMahon. This young student would prove to be extremely consequential. The Columbans would mentor Father Grawng to become a bishop, and in 1977, they handed over control of their territory in Myitkyina, Burma, as they departed the country.